Thanks to its sustained release technology, Seresto promises the type of protection you would expect from a topically applied medication in the package of an easy-to-use collar. 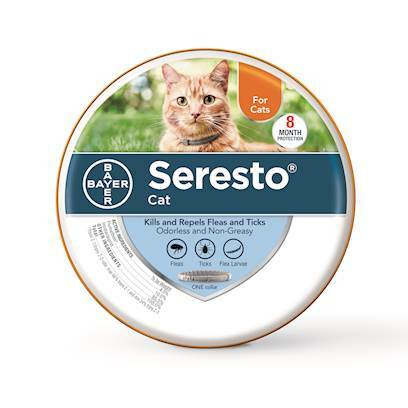 Promising a full 8 months of non-greasy, odorless protection, Seresto will put an end to the monthly headache of trying to get your cat to sit still while you carefully try to get that spot-on topical treatment on to their skin without making a mess. Remove the collar from the tin and laminated bag. Place the collar around your pet's neck. Push one end of the collar through the loop. Adjust the collar for correct fit. Snip off the excess collar. When fitting your pet's collar, make sure you can slip two fingers in between the collar and your pet's neck.